Cloth and clothing is something kids tend to take for granted. For Samhith, choosing a new dress is easy – just go to a shop, see what you like and pick it up. Considering his inquisitive bent of mind, it wasn’t long before the question came up – how are clothes made? One part was easy to explain – the stitching. For one, there are enough tailors around for him to know that cloth can be stitched in various ways, and thanks to my mom’s trusty old Singer Sewing machine, he also knows that we can stitch clothes at home! Also helpful was the fact that his uncle heads a garment manufacturing firm, and he was able to visit the factory and see how T shirts are made in bulk! However, the crux of the question remained – where does the cloth come from? How is the cloth made? Explaining about cotton and silk thread and weaving didn’t help much, and all I could do was wait for an opportunity to show him how cloth is woven. 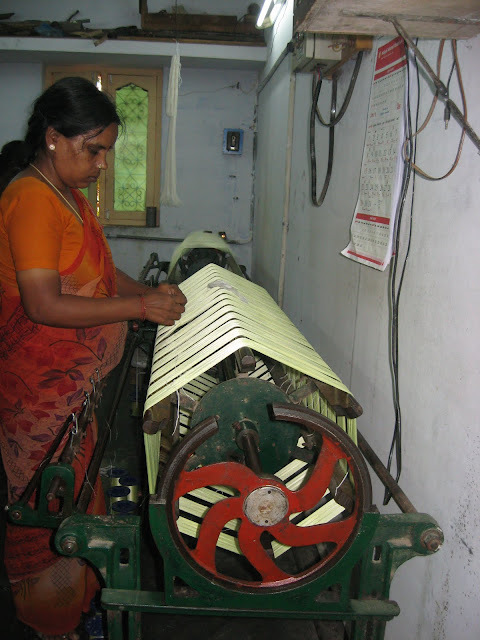 On our Aurangabad trip, we visited a saree shop which had its own power loom unit. 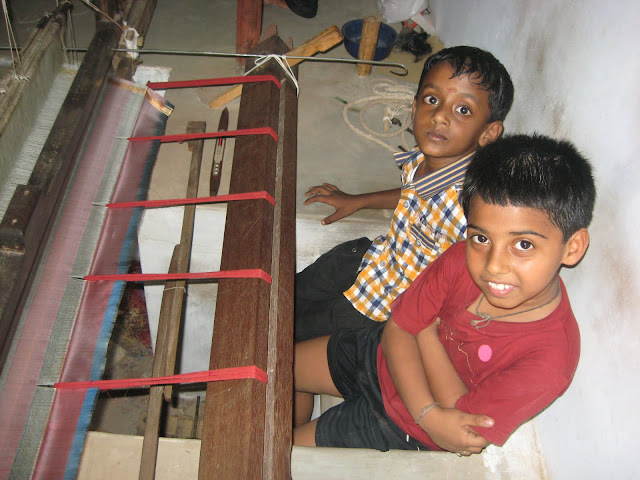 We managed to gain an entry, in spite of it not being generally allowed, and Samhith was able to see at first hand how the huge machines turned bundles of silk and cotton yarn into cloth in a matter of hours. 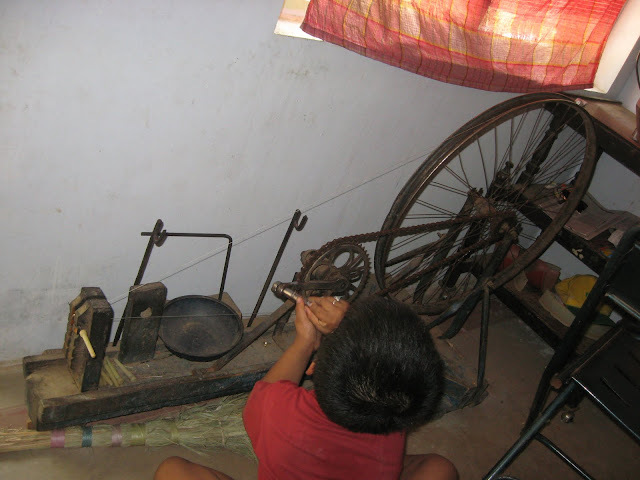 Unfortunately, the power loom weaving process was rather fast for him, and he had to watch from a distance, which didn’t help matters either, and he remained unsatisfied. 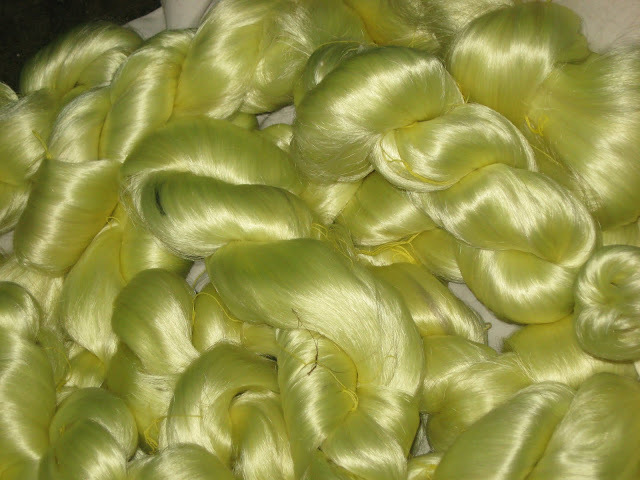 The silk yarn…. Waiting to be used…. 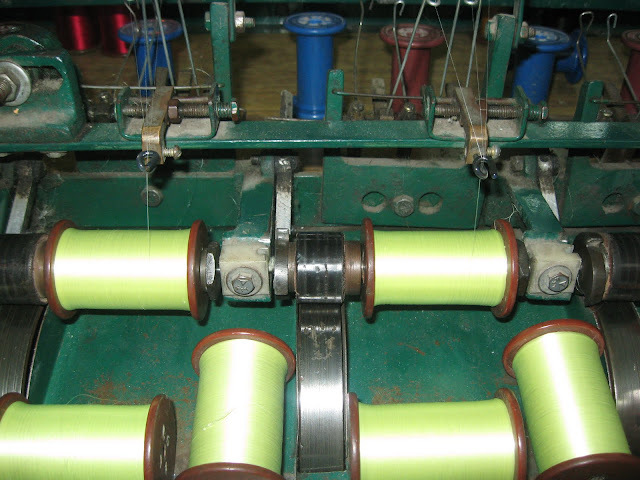 This machine winds the yarn mechanically…. While this one helps do the same, but manually…..
And here are the videos…..
We were told that one saree took anywhere from 3 days to a week to weave, depending on the intricacy of the pattern. The minimum cost for such a saree is about Rs. 3000 here, but it sells for over Rs. 5000 in the cities. 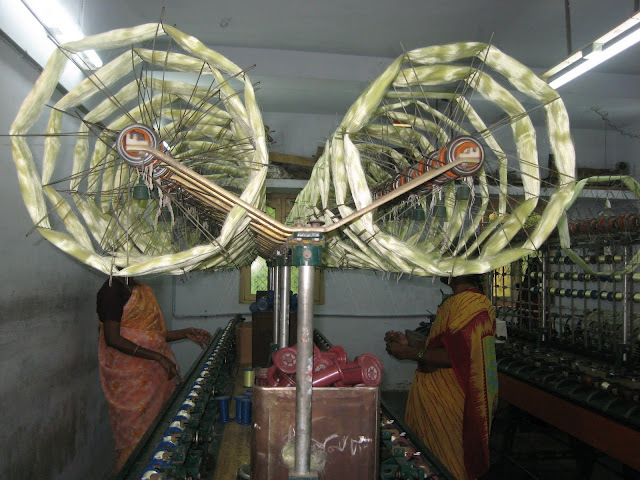 Sarees are made in bulk on orders from groups which then sell them in the larger stores in the cities. While the bulk of the profits go to the middlemen and the big stores, these people just about manage to scrape a living. 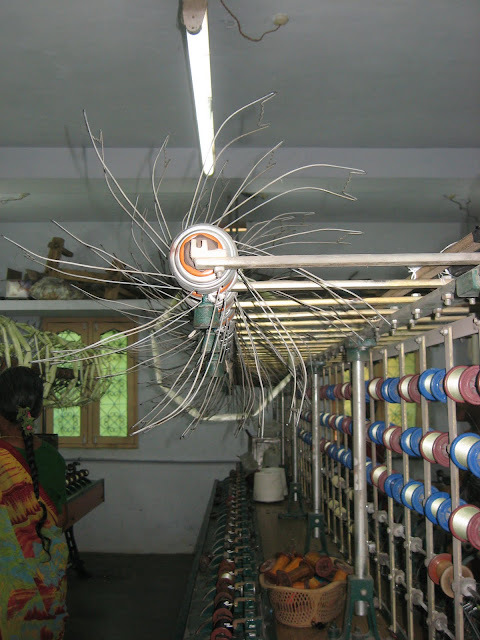 The art is slowly dying out as more and more weavers are leaving the village for better opportunities. There are few youngsters in the village even interested in continuing the tradition, since it barely pays them enough. There are just a few smart families, who have bypassed the middlemen and sell directly to shops and individual customers, though this still seems to be a rarity, since bulk orders need a large number of weavers, and the middlemen are those who actually bring so many of them together. A village which once boasted of at least 2 looms in every house today has barely one for every street. Like so many other folk arts, here is one more, which is dying a slow death. 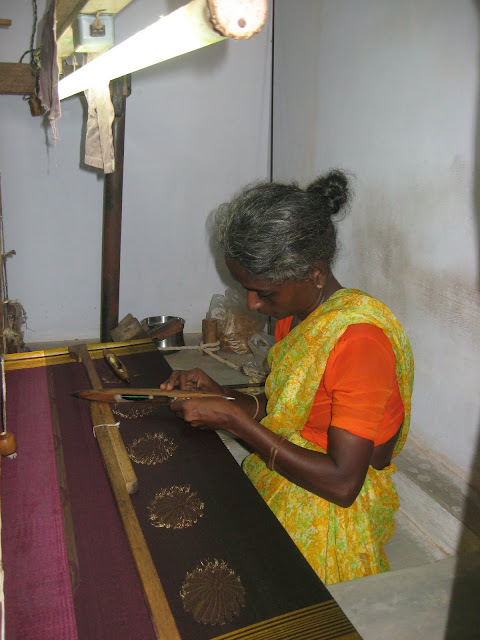 As we left the village, leaving the woman once again alone with her loom, I couldn’t help wondering….. We spend thousands and thousands on silk sarees, especially at weddings, but how many of us even think of those who make it possible for us to wear them? 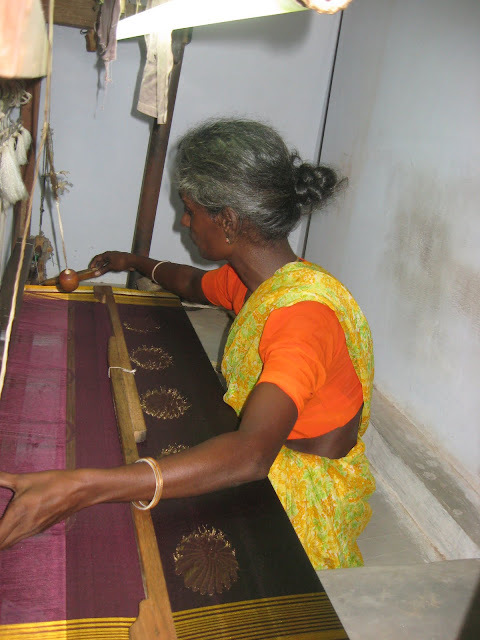 They do not even have the wherewithal to buy one such silk saree during their lifetime, or for their loved ones. What an irony that those in rags make such beautiful creations, but can never think of wearing their own creations!